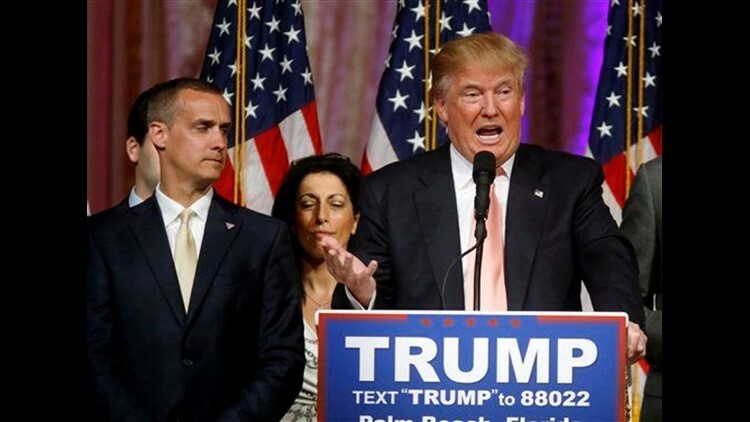 Florida police have charged Donald Trump's campaign manager Corey Lewandowski with simple assault in connection with an incident earlier in the month involving a reporter. JANESVILLE, Wis. (AP) — Police are looking for a man who pepper-sprayed a 15-year-old girl as opponents and supporters of Republican presidential front-runner Donald Trump clashed outside a Wisconsin rally. The altercation is the latest in a series of confrontations that have marred recent Trump events. Investigators have photos taken by participants at Tuesday's demonstration outside of the Holiday Inn Express that could help to identify the man with the pepper spray, Janesville Police Sgt. Aaron Ellis said Wednesday. Ellis said the girl told police she punched a man who groped her, and another man then pepper-sprayed her. The girl and a 19-year-old woman standing next to her were treated and released from a hospital, police said. Ellis said the girl could face charges for punching the man, identified by the Wisconsin State Journal as Dan Crandall, of Milton. "I didn't touch her," Crandall, a Trump supporter, told the newspaper. "She started to challenge why I was at the Trump rally since I was a grown man. I told her I was at the Trump rally because I was a grown man and I cared about my country." Video posted on social media shows the girl arguing with someone in the crowd before punching or pushing a person who was not shown on camera. The teen was then pepper-sprayed and walked away. About 1,000 people attended the rally at the adjacent Janesville Conference Center, while another 1,000 demonstrated outside the hotel in the hometown of U.S. House Speaker Paul Ryan, police said. About 350 law enforcement officers were there in case the demonstration or rally became unruly, said Janesville Police Chief David Moore. The confrontation Tuesday follows the arrest of six protesters Monday night who refused to leave the hotel's lobby. Police said the six were part of a group of several dozen protesting Trump's appearance. All five presidential contenders campaigned in Wisconsin on Tuesday, one week before the state's high-stakes primary election. Also Tuesday, police in Jupiter, Florida filed a criminal complaint against Trump's campaign manager, Corey Lewandowski, for a videotaped altercation with a reporter.